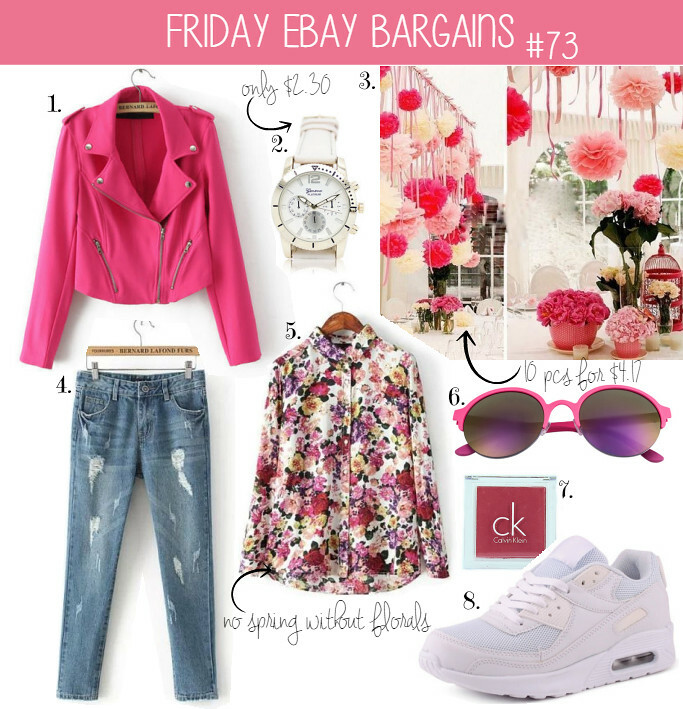 I think you can clearly feel the spring inspiration behind my this weeks Ebay bargains post! The weather in Latvia has been really tremendous these past couple of days ( well maybe except for today), I would even dare to say past couple of weeks! The temperature has been steady and sometimes even reaching more than 10 degrees by Celsius! Though, I would say that the weather outside has been a bit tricky as well, because there are big contrasts- one moment it is really hot and I take off my gloves, scarf and open my coat or jacket, but another moment a breeze of wind can leave me literally shaking! How is the weather in your country? I truly love each and every bargain I have found this week and I would wear them in a heart beat, therefore, choosing one favorite is really hard. But if I had a gun put to my head, I would probably go with those white sneakers, which by the way only cost $21.16! Manuprāt, pēc šīs kolāžas var ļoti labi noprast, kas ir bijis mans iedvesmas avots šim rakstam- pavasaris! Laika apstākļi pēdējās dienās ir mūs patiešām lutinājuši, nu šodienu laikam neskaitot, es pat uzdrīkstētos teikt, ka pēdējās pāris nedēļas ir bijušas lieliskas! Temperatūra ir bijusi diezgan stabila un dažreiz pat pārsniegusi 10 grādu atzīmi! Lai gan kaut arī laiks ārā tīri vizuāli liekas patiešām lielisks, ļoti bieži tas ir mānīgi, jo, piemēram, vienu brīdi var palikt tik karsti, ka es jau novelku nost gan cepuri, gan cimdus un attaisu vaļā savu mēteli/jaku, savukārt, citā mirklī vējš var pēkšņi izpūst cauri visiem maniem kauliņiem! Šonedēļ man patiešām ļoti patīk visas lietas, kuras es izvēlējos iekļaut šajā rakstā un es jebkuru no lietām nopirktu, ja vien tas būtu iespējams un mans budžets to atļautu 😀 Līdz ar to izvēlēties vienu favorītlietu ir pavisam grūti, bet, ja patiešām vajadzētu izvēlēties, tad tās būtu šīs baltās botas, kuras maksā vien 21.16 dolārus! Do you like my Ebay bargains? Which is your favorite? If you are new to Ebay ( don’t know how to register, use paypal etc), you can look at my guide HERE! Pink is my favorite color! These items make me happy 🙂 The weather here in Southern California has been pretty hot, more like summer weather than spring weather! But that means the pool and the beach, so I don't mind 🙂 Enjoy your trip! Happy friday! They're excellent from Spring and Summer. I love that jacket! These are all so cute 🙂 Thanks for sharing! Love that pink biker jacket! That pink motto jacket is incredible and perfect for spring! Love these shades of rose and blush – so fun and romantic! The white sneakers are great, I love the mesh detail, and I just may buy them! Thanks! I also love that floral blouse. I am so glad to see florals for spring! I hope the weather stays nice!